"I'm sorry, I just don't see any evidence. I mean, look at the Hubble telescope. It's discovered untold wonders of a vast unexplored universe. But not one picture of a guy with a beard sitting around on a cloud." "I looked and looked but I didn't see God." "For what can be known about God is plain to them, because God has shown it to them. For his invisible attributes, namely, his eternal power and divine nature, have been clearly perceived, ever since the creation of the world, in the things that have been made. So they are without excuse." Buona sera. I'm sure most of you are familiar with "The Family Guy". This animated show is offensive on many levels, mainly to Christians and Conservatives. (Don't believe me? Count how many times Seth MacFarlane, the liberal atheist who runs the show, takes pot-shots at liberals and non-Christians.) Even though I cannot recommend the show because it is often blasphemous and obscene, I have to admit that MacFarlane is exceptionally talented, and the show has its moments of comedic genius. But my point in bringing this up is that the scene I quoted from is a good illustration of preconceptions. We all have them, though many people do not know it, or even try to deny this basic fact of life. Even scientists. Throw away that image you have (your own preconception) that scientists are completely objective and unbiased. Instead of following the evidence wherever it leads, they have a preconception of what they want to prove. That can be a good thing when a scientist is saying, "I wonder if this will prove that I'm right about the effects of bicycles on rainfall", or something. It's a bad thing when they start out with an attitude of forcing the evidence to fit into a box at all costs. You see, science is supposed to stay with things that are measurable, testable, repeatable, falsifiable, etc. When scientists venture into the realm of philosophy, they leave true science behind. What gets confusing is when people will move back and forth between science and philosophy, thereby proclaiming their philosophy as actual science. As I said before, we all have our biases. Just because you have something to prove does not automatically negate your position. Both unbelievers and believers have presuppositions, our starting points based on our worldviews. Theirs is usually based on materialism or naturalism, and ours is based on the revelation of God in the Bible — and they hate that. Since the Christian is supposed to please God rather than men, the foundation of our thinking in every area is the Bible. The "Brian Griffin" quote at the top and the Yuri Gagarin attribution show a common preconception, that God is a big, grandfatherly man with a beard that can be seen better from space. If someone is going to seek God, it is best to drop the above preconceptions and biases. Then, honestly consider that he may be there after all. But he does not have to play by your rules; God has already been made known (John 1.18, Rom. 1.20). However, knowing that God exists means that he's the Creator, and we should find out what he has to say. That involves swallowing too much pride for some people. This applies to evolutionism as well: Perhaps it is not true after all, that evolutionism's critics and the scientists who have abandoned it may be correct in doing so after all. Buon giorno. First of all, time for a confession. Despite all of my tough-guy image and experiences, I'm a fan of LOLcats. Especially the "Basement Cat" legend that has been created. 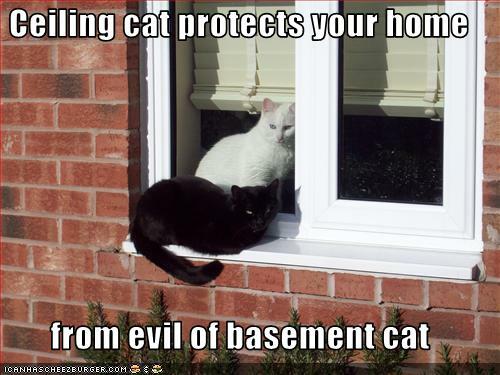 For reasons I will not get into, I had to put up with evil in my own home. This is a long-haired black 'n' evil Basement Cat that I knew before. And dafter than a brush. This prissy beast comes over to me and gets loving and all. Fine, pet the cat, I'm fond of cats. Most of the time. Later on, I get the wide-eyed stare, and the beastie runs from me. The old "I'll hide under the bed but leave my tail showing" trick. So, I did the thing we used to do: Touch the tip of the tail with my stocking foot. What do I get? Hisssss! Looks like playtime has changed for Miss Priss. Another time, I was walking toward the beast so I could pass her on my way to the bedroom. She gets up with the big-eyed angry panic look, and hisssss while running away. Another time, similar situation. Prissy runs to the room ahead of me, stops four feet away and stares. I commanded, "Hiss!" And I got one! So anyway, this Basement Cat lives with two man-hating lesbians. More than a coincidence? I think not! Anyway, she lightened up and began to like me (I have irresistible charm and all that) just before she returned to the Den of Iniquity. Maybe next time, I will say a prayer to bind the forces of evil.